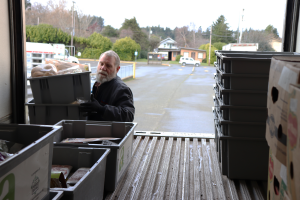 Volunteer driver Steve Taylor collects donated groceries from the North Bend Safeway. A grant from the Coquille Tribal Community fund will let the Fresh Alliance program expand to include local McKay’s Markets. When you’re short of cash and the cupboard is bare, a box of canned goods or a sack of pinto beans is a godsend. But food bank fare can be a monotonous diet. 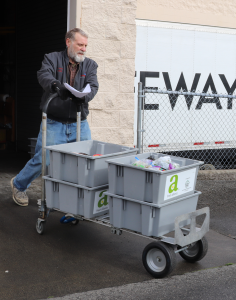 “Even if you’re living in poverty, you don’t want to eat the same thing every day,” said Sara Stephens, development director for Oregon Coast Community Action. The solution is Fresh Alliance, a creative project backed this year by a Coquille Tribal Community Fund grant. Operating as part of ORCCA’s Food Share program, Fresh Alliance collects expired baked goods, produce and other foods from markets each day. Those foods – past their sell-by dates but still safe and tasty – go to local food banks, providing nutrition and variety to hungry families. Thanks to Fresh Alliance, a family’s food box might contain fresh strawberries, salad greens, pastries – even a T-bone steak or a salmon filet. “The ability to provide that is amazing,” said Laura Hunter, who directs South Coast Food Share. South Coast grocers donate abundantly to Fresh Alliance – more than 400,000 pounds of food in 2017 alone. The numbers could be even higher, but ORCCA’s capacity to process donations has limited the number of stores taking part. This year, a $20,000 grant from the Coquille Tribal Community fund will let Fresh Alliance add all seven local McKay’s Markets to its donor list. McKay’s will join Fresh Alliance’s existing list of donor stores, which already encompasses Fred Meyer, Safeway, Walmart, Ray’s Food Place and Cash & Carry. The seven additional stores will let ORCCA supply many additional tons of fresh groceries to local food banks. Once collected by volunteer driver Steve Taylor, the fresh food will be distributed promptly to local food banks. Along with nutrition, Fresh Alliance’s diverse offerings deliver a rare sense of luxury to food bank clients. She recalled a young mother in Coquille who had no cake for her 4-year-old daughter’s birthday. Her food bank had one on hand – already lavishly decorated in a girlish theme. “She just had tears in her eyes because they were going to be able to have that cake for her kiddo,” Stevens said. Fresh Alliance is one of 57 organizations sharing more than $290,000 in Coquille Tribal Community Fund grants this year. Twenty-three of those programs, including Food Share, fall into the fund’s Health category, accounting for more than $130,000 of the total.